GoGo Sentai Boukenger was released between 2006-2007 and was the 30th anniversary series for the Super Sentai franchise. The Boukengers are part of the Search Guard Successor foundation, a worldwide organisation that hunts down powerful ancient relics known as Precious. There are many organisations (known as Negative Syndicate) who plot to use these Precious for evil, and it is the Boukengers job to put a stop to them and collect dangerous relics all over the Earth. The Boukengers are made up of Satoru Akashi (Bouken Red), Masumi Inou (Black), Souta Mogami (Blue), Natsuki Mamiya (Yellow) and Sakura Nishihori (Pink). They are later joined by Eiji Takaoka (Bouken Silver), a monk-like warrior who defends the world from demons known as the Ashu. Before I begin this review, I should warn you that's going to be a recurring adjective all the way through it - and that's boring. I found pretty much everything about this show boring. Satoru is just the typical red leader type, which is some ways is refreshing as the previous 2 sentai series lacked this, and he does get some good character-centric episodes (particularly episode 27) doesn't really have that much depth outside "always seeking an adventure".The mystery of just who Natsuki is is quite prevalent for the early episodes of the show, then is forgotten about for ages until its brought back for a rather lackluster 2-part episode in which we find she shares a similar origin to Superman, but is destined to destroy modern civilisation. Exciting. The same goes for Masumi, who outgrows his rivalry with Satoru as the series progresses, only for it to return at the tail end of the series for a few episodes when he becomes the focus again (although the show does handle his return to the rivalry in a rather amusing fashion). Eiji is a very interesting character when he's first introduced, but once he becomes Bouken Silver he joins Souta and Sakura in the ranks of being bland and forgettable characters. Finally, Zuban, the show's "extra hero" (like Kakuranger's Ninjaman or Carranger's Signalman) isn't even a character - he's a plot device at best. Unfortunately, Boukenger's vast array of villains aren't that interesting either. While admittedly Boukenger does change the status quo a little bit by having various groups of villains (a total of four) all working at the same time (meaning there are times when they are either working together or working AGAINST each other), all of the groups are pretty dull. Each of their back stories are minimal (Ryuuwon does receive a brief origin, but it's rather one dimensional) and none have any particular depth to them. Gajah, the series' main antagonist, looks very similar to the more human-esque villains you would seen in earlier Sentai shows, but looks very silly alongside the more modern-styled villain suits in the series. The worst offenders in the show are definitely Dark Shadow (a ninja organisation who sell Precious to the highest bidder), whose best character doesn't actually get good until he betrays the organisation (and is subsequently beaten shortly after) and are led by an blue owl. And, a blue owl - and the saddest part is said owl would have been the most interesting character in the series if he had received more than 10 seconds of back story. At a stretch, the Questers (the final antagonists to be introduced into the show - reanimated versions of Ashu demons Eiji defeated) are the best of the bunch, but then they are also the first to get defeated. On the subject of final defeats, the villains that don't survive the series all receive some sort of glory in their final battle, but each at the same time they all tend to feel anticlimactic. The final episode of the show lacks the exciting element of a final battle that shows that came before (and after) it had, and its main redeeming feature is its "half a year later" epilogue (although admittedly I'm a sucker for epilogues such as this), which does answer a question that had been bugging me the entire series. I won't spoil it, but all I'll say is it's not even guessable until the penultimate episode. But it's not all bad, episode 25 is by far the stand out episode of the show - handling the "monster of the week doesn't want to fight" plot line in a way I've not seen any other show do, making it all the more heartwarming (and for once, has a relatively happy ending for all involved). The mecha are very good in the series too, even if the main mecha gets shunted off a little too quickly for my liking. DaiBouken has a very interesting design, a lot bulkier and more detailed than previous mecha, a long with some interesting (but fitting) weapon choices - a pickaxe and shovel that combine into a sword. What I particularly like about DaiBouken though is that when additional GoGo vehicles arrive on the scene that can combine with it, the robot is capable of storing the swapped out limbs in its hollow legs, meaning all the pieces remain on the robot at all time (something the current series mecha GokaiOh fails badly at). Super and Ultimate Daibouken aren't quite as good design-wise if you ask me (and as I said earlier come into the show far too quickly), but are still fairly decent and Ultimate doesn't look too cluttered for something that's made up of 10 separate vehicles. I don't think Bouken Silver's SirenBuilder is a bad mecha, but I'm not a huge fan of it either so I don't really have a lot to say about it. However the main team's second giant robot, DaiVoyager is a beast of a robot! I don't really understand why an organisation like SGS would need a giant battleship of that calibre, but I can roll with it...and besides, its ship mode is a great homage to the battleship mecha of the early Sentai shows. Finally I'm going to take a moment to talk about Boukenger's entry into the VS series of movies, as because it is an anniversary show its a "Vs Super Sentai" movie rather than vs the previous show (which in this case would have been Mahou Sentai Magiranger). 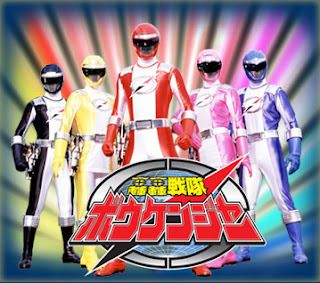 The film features the first appearance of AkaRed, an embodiment of the spirits of the 30 red Super Sentai warriors, and also returning characters (both heroes and villains) from earlier shows. While the film gets off to an excellent start, I can't help feel it trails off toward the end and is lacking in some aspects. The most disappointing thing about the movie is that in reality its only really the last 6 years of Super Sentai on show (the returning characters are all from Gaoranger, Hurricanger, Abaranger, Dekaranger and Magiranger) and so doesn't really feel like a THIRTY year celebration. In many ways, GoGo Sentai Boukenger feels like a back to basics tribute to Super Sentai, combining the formula that had gone down so well in Japan for 30 years and sprucing it up a little with some of the more modern flair the franchise had picked up over the years. It's by no means an awful series, but one that's likely to divide opinion more than others. Some will enjoy it - but I found it really boring and the worst out of the seven Sentai series I've watched thus far. In short, not the best 30th anniversary celebration the franchise could have had if you ask me. Yeah, i decided to drop Boukenger. I feel like it's not going anywhere, it's not building up to anything, there's no recurring plot line, it's just treasure of the week. Series REVIEW: Power Rangers S.P.D.